The 11th annual IMCCA Lunch and Learn featured a dynamic panel of speakers that represented 11 UC companies. The panel was moderated by Ann Earon, IMCCA chairperson, emeritus, IMCCA program manager, and president of Telemanagement Resources International (TRI). Taking a broad, enterprise-wide, big-picture approach to unified communications was one of many common themes expressed at the 11th annual IMCCA Lunch and Learn. The dynamic panel of speakers included representatives from 11 UC companies, moderated by Ann Earon, IMCCA chairperson, emeritus, IMCCA program manager, and president of Telemanagement Resources International (TRI). Over southwestern grilled chicken salads, attendees tuned in to understand the latest in unified communications, a field bursting with disruptive technologies and growth opportunities. “It’s not about the technology, but how you apply it,” said Mike Brandofino, EVP, video and UC, AVI-SPL. Focusing on applications opposed to the technological bits and pieces that make up systems is one of the approaches AVI-SPL is taking. For Polycom, "it all comes down to the choice of our customers," said John Antanaitis, VP, product solutions, Polycom, paying particular attention to where customers want Polycom to go, and not where the industry wants it to go. 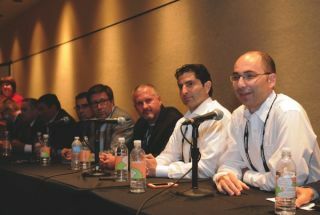 Scalability of solutions was another recurring theme several of the panelists brought up. “Videoconferencing has stalled because of desktop mobility,” noted Adam Marlin, Pexip, EVP, enterprise and commercial. One focus for Pexip, a newcomer to the UC industry, is “lessening the bandwidth burden,” Marlin said, in an effort to make solutions more affordable, resulting in broader implementation of UC technology.